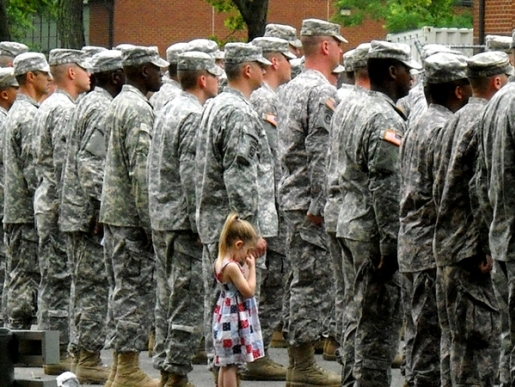 Four-year-old Paige Bennethum didn’t want her father, Staff Sgt. Brett Bennethum, to go to Iraq when his unit got deployed from Fort Dix, New Jersey. As the soldiers fell into formation to prepare to make their departure, no one had the heart to pull Paige away. The result is the above heartbreaking photo taken by Paige’s mother Abby. How she was able to take the photo through a layer of tears I’ll never know. I mean, I’d like to think I’m pretty wise to the horrors of the world. I’ve got friends who are veterans of various wars, and I know how big of a toll that took on them physically and psychologically. My family has many war veterans within its ranks, as well. Still, even I have to admit that looking at that photo (and trying to write about it) has made the room very, ahem, dusty. Yes, my allergies are really kicking in. Ahem. Sgt. Bennethum is expected home in July 2010. I think the entire world is pulling for him to return home to his wife and three children (and stay there) safe and sound after this photo. Heartbreaking.